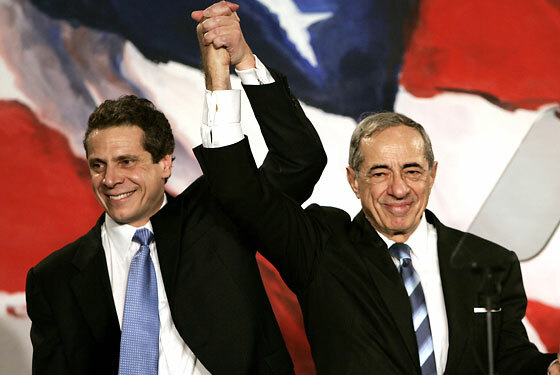 In what would normally be an innocuous introduction, former governor Mario Cuomo recently helped connect lawyer Philip Howard, a representative of investment firm Mezzacappa Management LLC, with an influential adviser to state Controller Thomas DiNapoli. Cuomo was not paid for the introduction, and the advisor himself, Pat Bulgaro, is only working as an unpaid consultant to DiNapoli. But the Daily News raises its eyebrows at the connection because Mezzacappa Management has been under scrutiny by State Attorney General Andrew Cuomo for months now. Under former Controller Alan Hevesi’s tenure, the state’s pension fund had made a $400 million investment with Mezzacappa, a series of deals that the attorney general began to examine after it was revealed that top firm officials had donated over $100,000 to Hevesi’s campaign. Hevesi himself resigned in 2006 before pleading guilty to chauffeuring his wife around using state vehicles and employees, and Andrew Cuomo has been looking into the possibility of a pay-for-play scam during his tenure. It’s a complex situation in which nobody yet appears to have done anything wrong, but young Andrew can’t be pleased that his father is disregarding his investigations enough to help out a company that’s suspected of already getting too much help from Albany politicians. You know, he’s doing a really good job these days and people are getting to respect him for who he is, not who his dad was. Can’t you just let him shine? For like, one minute, Dad? God. UPDATE: A spokesman from the Attorney General’s office contacted us today to emphasize that Mezzacappa Management has cooperated with all of their requests for information and is not currently the subject of an investigation.